Acorns are an amazing US local perennial food that should have a common place on our tables. They make delicious, nutrient-rich gluten-free flour as well as tasty nuts. We eat them as mush cakes, acorn burgers, acorn soft cheese and acorn flat bread. They are rich in protein and fats as well calcium, phosphorus and potassium. While these traditional desert treats are not an easy harvest, they are well worth it. Plucked while the flower buds are still tight, carefully brushed free of spines and dried, they taste somewhat like a tart artichoke heart. Delicious sautéed with onions and roasted chiles, as a pizza or polenta topping or an interesting addition to your favorite wild ferment, cholla buds are also extremely calcium rich - two tablespoons of the dried buds contain more calcium than a glass of cow’s milk! Dried buds must be rehydrated before cooking, and will keep for years in your pantry. Dried cholla buds available here. When fall arrives in the north of New Mexico, so do the roadside vendors selling bags of fresh and roasted piñon. For those who aren’t familiar with this traditional New Mexican foraged crop, these pine nuts are completely different from what you can buy in the store. Sweet and nutty, with delicious notes of resinous pine they are a fall treat unlike any other. In addition to being out-of-this-world delicious, they are also a nutrient-dense high desert treat – full of protein, good fats, magnesium, phosphorus, zinc and more. Tepary beans are a high protein desert bean that flourish in hot, arid conditions and have been harvested and cultivated by desert-dwelling indigenous people in Northwest Mexico and the American Southwest for over 4000 years. The varieties commonly eaten now are the descendants of the wild desert beans, carefully selected for bean size and other helpful traits. These tiny beans have an incredible rich, earthy and nutty flavor, are known to be less gas inducing than their common beany cousins and have a low glycemic-index. Dried tepary beans available here. Mesquite is one of those desert foods that help you feel like everything might be OK. These arid adapted trees survive on tiny amounts of precipitation in scorching conditions, improving the soil while they produce super tasty nutrient-dense food. Velvet and Honey Mesquite trees both produce delectable pods that can be easily simmered into the desert’s version of maple syrup, or dried and ground into a high-protein, mineral-rich, gluten-free, low-glycemic flour. This important desert food has been harvested for thousands of years by desert-dwelling indigenous peoples, and only recently has been become more popular as a mainstream food. Mesquite has a rich honey-sweet flavor with notes of chocolate, cinnamon and a light floral smokiness taste. Really delicious – perhaps our favorite harvest. Mesquite flour available here. Mesquite jelly available here. Sometimes called the “mother of all chiles” this tiny wild chile makes up for its small size in flavor and heat. Native to the North American south and South American north, this wonderful chile is increasingly rare in its US growing areas and protected. 6-40 times hotter than a jalapeño with an intriguing smokiness and fruity notes, it is a truly unique and special wild food. Chiltepines make an incredible addition to your fermented wild hot sauce and are even delicious on ice cream. Prickly Pear – worth its weight in pain. 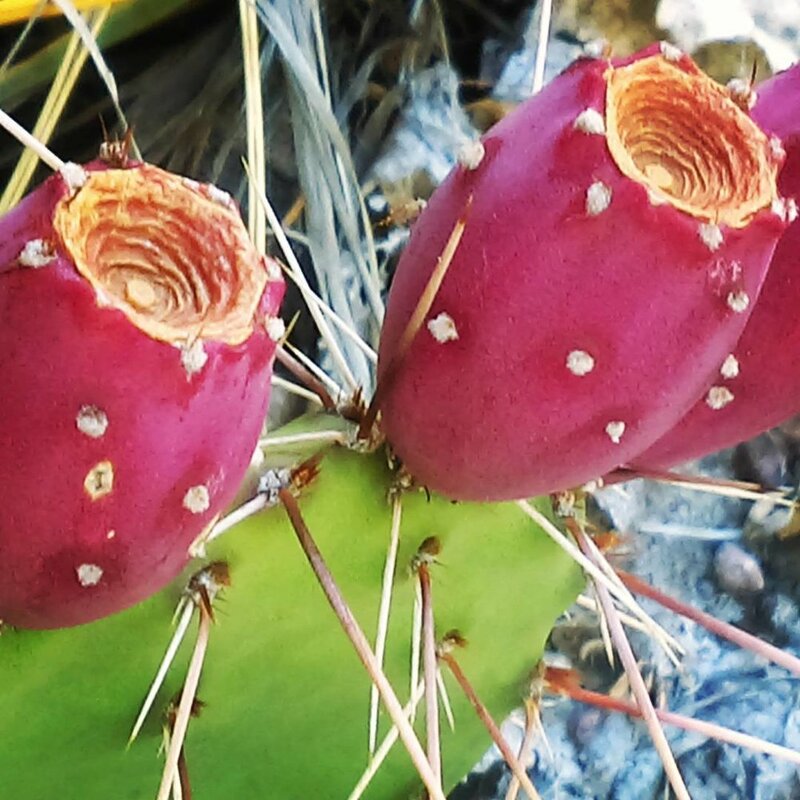 These luscious jewels of the desert are a reliable wild fruit, even in our driest deserts. Their mild, sweet flesh is also a super food – rich in copper, magnesium and phosphorus. (And if you get to them fresh, vitamin C too!) No matter how you hard you try to protect yourself, the tiny glochids will find your fingers and help you remember the harvest for days. The soothing delicious magenta colored juice is more than worth the effort – you will come back every year. Prickly pear nectar (fruit concentrate, no sugar) available here. Prickly pear jelly available here. Chokecherry fruit spread available here.